This model, with its scratch-resistant sapphire crystal, features a sand-blasted grade 5 titanium dial with Arabic numerals and a date window at the 6 o’clock position. The dial presents a small seconds sub-dial, as well as 60-minute and 12-hour counters on one dial for intuitive reading of elapsed time. Mounted on the 45.5 mm grade 5 titanium case, is the world's premiere grey silicon nitride ceramic bezel with orange rubber. The diving scale of the bezel is crafted with Liquidmetal™. The OMEGA Seamaster Planet Ocean 600M Master Chronometer Chronograph is water resistant to 60 bar (600 metres / 2000 feet), and has a helium-escape valve. 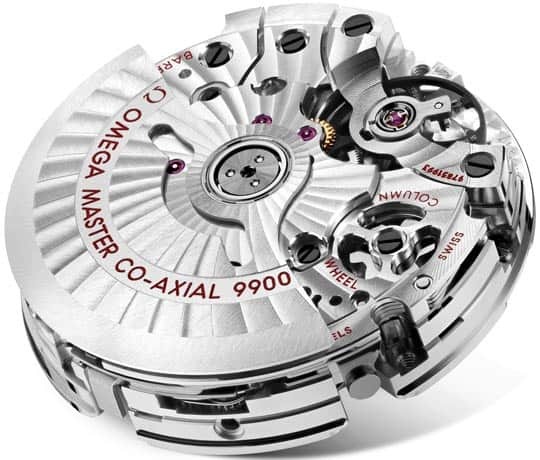 The OMEGA Master Chronometer calibre 9900 at the heart of this timepiece can be seen through the transparent caseback. To achieve Master Chronometer status, it has passed the 8 rigorous tests set by METAS (The Swiss Federal Institute of Metrology). Self-winding chronograph with column wheel and Co-Axial escapement. Certified Master Chronometer, approved by METAS, resistant to magnetic fields reaching 15,000 gauss. Silicon balance-spring, 2 barrels mounted in series, time zone function. Central hour, minute and chronograph seconds hands, small seconds hand, 12-hour and 60-minute recorders. Rhodium plated finish with Geneva waves in arabesque.